Alright! The day of the big event has happened and here is how it shook out. Overall the day was great due to the awesome planning from the PE department. So the day went well but how did the Google Form and Google Sheet hold up? In short it did fine but there are still some issues so let’s get into it. We do not have WiFi outside at my school. Originally I envisioned that teachers who were manning the station would open up the form on their phone and enter the results. The organizers weren’t thrilled with this idea. First, we are asking teachers to use their personal phone and their own data which is admirable but maybe not the fairest thing to do. Then there is the possibility that their phone could be damaged and well … that is not a fun scenario. Then there is the possibility that the teacher will enter the information incorrectly causing problems. So we have the organizers putting inputting all the results. The people running the event scored everything on a score sheet and then turned it in at the end. The problem is that the form was meant for individuals to input the results for a single team per event. For one person inputting all these at once is a problem. It just takes too long. It got done but it was a bit of a rush. 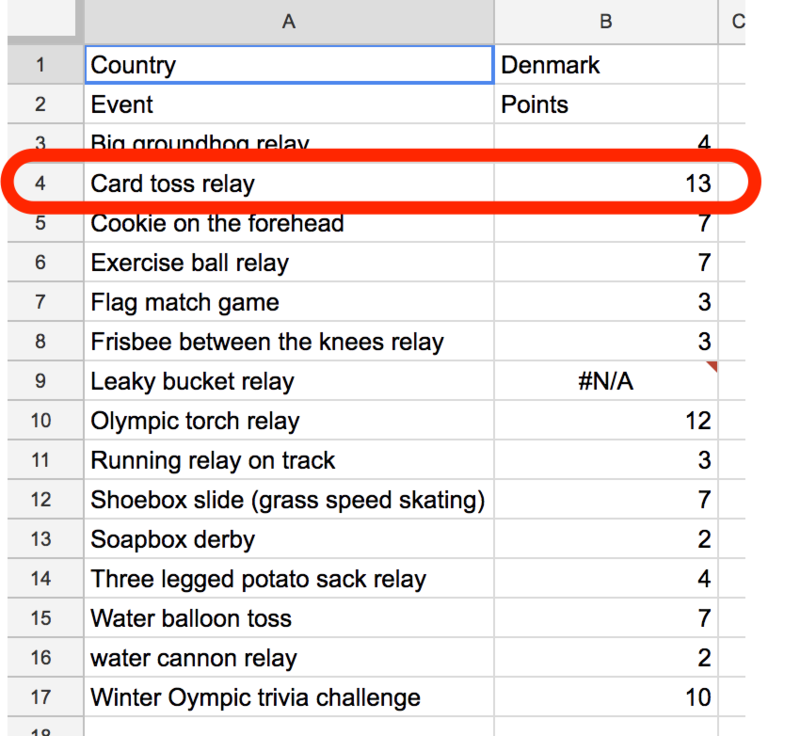 In the future I will make the Google Form so the organizer can input all results for an event at one time. The spreadsheet part will not change too much. The math will still work the same way. I mentioned before that ties are a problem with the spreadsheet. The vlookup function does handle ties well. Check out the image below to see what I mean. Now the problem here isn’t that Denmark got all of those points because they did not. Check out the image below for proof. The problem is the other teams get the shaft a little. 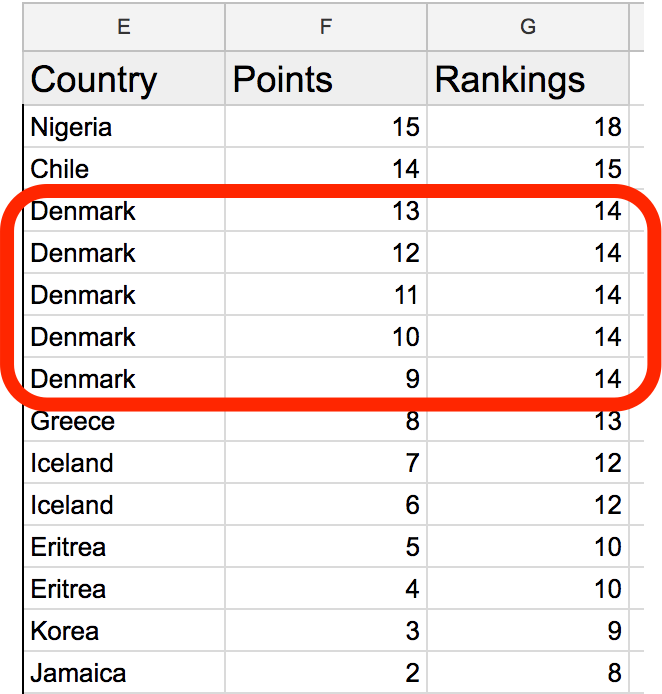 Even though the four other teams did just as well as Denmark they receive progressively less points. I need to figure this out and if you have any suggestions please leave them in the comments below. This is a fun event and really the winner(s) is not the most important thing. We have two weeks until school is out and everyone is stressed and this is a great way to help get some of that energy out and forget about your worries for a day. The Google Form and the Google Sheet did hold up very well. It seemed to have no issues recording and then handling the data. Overall, it worked and worked fairly well. I just need to tweak it and try to make it better. 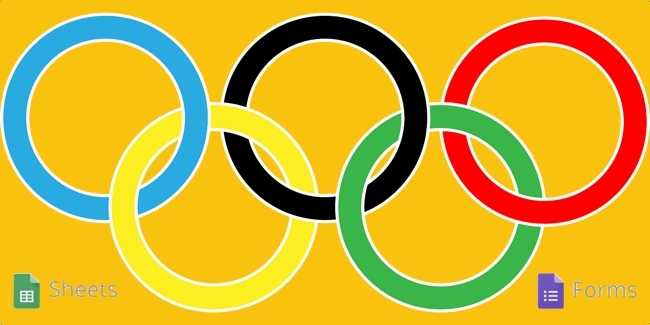 This entry was posted in Google Apps, Helpful Tips, Patrick Cauley and tagged google forms, google sheets, olympics. Bookmark the permalink.